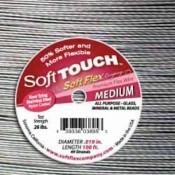 Beading wire which is also known as "Tigertail" is the most popular flexible wire for bead stringing and is generally crimped to finish the ends. 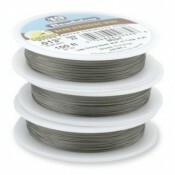 We have a huge range of brands, colours, sizes and qualities in this versatile wire! 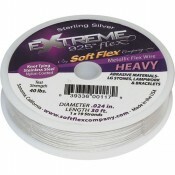 Just one tip is that the greater the number of strands the more flexible and better quality the wire is - 7 strand is the base level, 19 & 21 strand are the designer mid-level and 49 strand the top professional level. 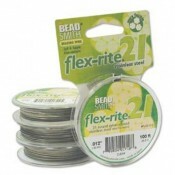 Diameter is also a consideration - .010-.015" is fine for small beads, .018-.020" is medium for medium sized beads, and .024" and heavier for bigger beads. 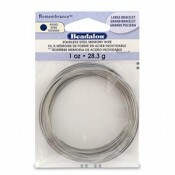 Memory wire is also in this section - this is a super strong stainless steel wire which has a 'memory' and can be used for bracelets and necklaces that retain their shape and spring back to shape after being stretched.